It was a very emotional and historic day for all followers of Srila Prabhupada, as hundreds of them formally accepted him as their diksha guru. 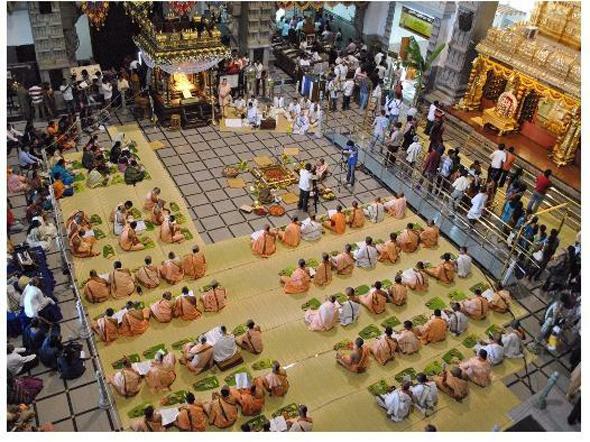 The formal diksha ceremony was held in Hare Krishna centres of Bangalore, Mysore, Hubli, Vrindavan and Chennai. The respective Presidents of the temples conducted the harinam diksha and second initiation ceremonies. The ceremony consisted of each of the devotees taking an oath in front of Srila Prabhupada’s deities that they will follow the four regulative principles and chant at least sixteen rounds of Hare Krishna Maha Mantra daily. Following which each of them were given japa beads which were already chanted on by the GBC appointed rtviks and the temple presidents announced the initiated disciples’ names declaring to all present that these devotees were accepted formally as disciples of His Divine Grace. This was followed by a Vaishnava homa, fire sacrifice which was performed by the devotees of temple with the respective presidents presiding over it. All devotees participated with great enthusiasm in the kirtan which followed the fire sacrifice. Kirtans in the temple were always ecstatic but todays’ kirtan was more ecstatic because of the fact that all of them had formally accepted the shelter of the lotus feet of a pure devotee. One of the highlight of this time was that about 3 devotees from Russia, headed by Krishna Kirtan Prabhu, also formally took harinam diksha and accepted Srila Prabhupada as their spiritual master. The ceremony was preceded by a short discourse given by each of the temple presidents, in which they explained the significance of the ceremony. Today is a historic day for the followers of Srila Prabhupada. As we all know, after Srila Prabhupada’s physical departure, his direction on how initiation has to be conducted was not followed. As an institution at large, a new deviant system was followed, and is still being followed in the other ISKCON temples. Only in 1998-99, we the devotees of ISKCON Bangalore became aware of the actual directions given by Srila Prabhupada in the form of an institutional directive of July 9th, 1977 where he had directed that he will still remain the diksha guru giving initiations with the eleven devotees he appointed acting as ritviks or representatives of the acaryas. But in ISKCON at large, the eleven had started acting as diksha gurus without authorization by Srila Prabhupada. And since some of the eleven had fallen away from spiritual path, the GBCs had appointed several more diksha gurus, once again without authorization from Srila Prabhupada. After we became aware of all these deviations, we asserted that we shall follow the directions of Srila Prabhupada in the matter of initiations and as you are all aware has led to litigations, and Srila Prabhupada has mercifully protected us all along. There was yet another deviation that the ISKCON temples all over the world have become guilty of. Srila Prabhupada had given a written document in 1970 called the Direction of Management for the formation and functioning of the GBCs. According to this document, the GBCs have to be for a period of three years and should be reelected once every three years by the body of Temple Presidents. ISKCON has not been conducting the elections of the GBCs. Considering all these, in the year 2008, the devotees of ISKCON Bangalore group, who had, by the mercy of Srila Prabhupada, set up separate centers in India with about 17 Temple Presidents, conducted elections and appointed a ten member GBC for our group of devotees. Further, a few months back, GBC body passed a resolution that the GBC body shall appoint the rtviks for the purpose of performing initiations. This important resolution for appointment of rtviks was also ratified by all the devotees in the temples through a referendum. The GBC body has passed a resolution recently that all the current members of GBC will act as the Ritviks. And to avoid any misunderstanding or creation of incorrect trends in the community of devotees, it has also been decided that even though every word of July 9th directive is followed in letter and spirit in initiating devotees, the particular ritvik for a particular devotee being initiated shall not be disclosed. All the devotees must understand that Srila Prabhupada is their diksha guru and they should serve his mission through the institutional arrangement of temples, temple devotees, Temple President and GBCs. All the devotees present here today for the Initiation ceremony, on this auspicious day of Gaura Purnima 2011, have been recommended by the respective Temple Presidents and they are taking eternal shelter of Srila Prabhupada as his disciple agreeing to chant 16 rounds everyday and follow four regulative principles. Praying for Srila Prabhupada’s mercy to give us protection and guidance to conduct his sacred mission, let us conduct today’s initiation for the first time in the history of ISKCON, according to Srila Prabhupada’s own direction given in the July 9th 1977 directive. Please give me eternal shelter at your lotus feet and accept me as your disciple. 1. I agree to chant 16 rounds of Hare Krishna Maha-mantra everyday throughout my life.